Having facilitated workshops for the last 3 decades, I’ve learned a few things about what makes a training room ROCK (or not)… both for the audience and the speakers. 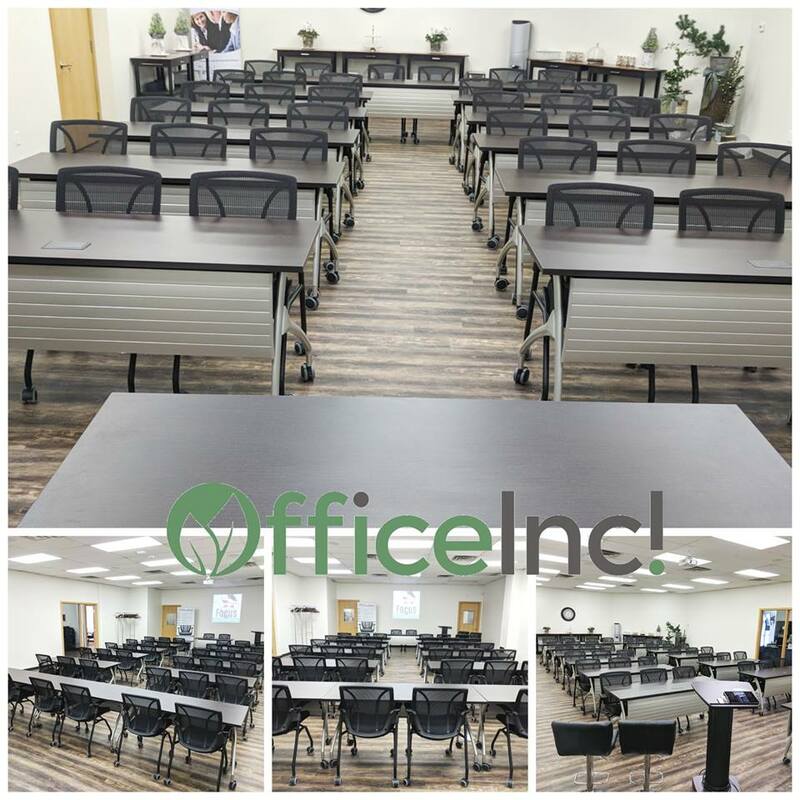 When designing our 1,100 square foot Training Room at OfficeInc! located at 54 Cedar Pointe Drive, Unit 1207, in Barrie, I wanted to create a space that will WOW! – A floor with cork underlay eases the strain of standing for long periods. – There are 2 uber comfortable, adjustable-height, swivel bar stools for you and your facilitation partner (when presenting as a dyad) at the front of the room. – Flexible 2gether Tables from Global Furniture Group allow for many room configurations and have modesty panels along the front. – In-floor power and HDMI to the podium and powered tables means no cords to trip over and the ability for your attendees to plug-in their devices. – The podium connects directly to the overhead projector and 6 ceiling-mounted Bose speakers. – An AppleTV unit on the projector allows anyone in the room with a MacBook, iPad or iPhone to share their screen to the projector, as well. – The height of the ceiling and overall dimensions of our Training Room, makes the room an acoustic gem! We’ve received great feedback on how voice travels in the space. – The space is available by the day (8 hours), half day (4 hours), for 2 hours in the early morning (6:30-8:30am) or 3 hours in the evening (6:00-9:00pm). – When booking the space, we will always have a 30-minute+ buffer between events for clean-up and set-up. – The room rental comes with Coffee, Tea and Water service. – Want food service? Sarah Elliott, our Director of YUM!, will customize a menu for you or we can bring in outside catered meals (such as Indigenous Foods, Sushi, Sweets, and more) through our catering partners. – Keypad access to the training sector of our facility is available for trusted clients before or after regular business hours. – Ample free parking and less than a minute from Hwy 400. – Our facility is wheelchair accessible. All external doorways and internal meeting room and office doorways meet the required width and the sidewalks leading in are compliant, plus we have 2 wheelchair accessible rest rooms. We’ve also installed braille signage for the visually impaired. Planning a series of workshops for 2018? Book the space between now and the end of January, and you will be able to take advantage of our introductory pricing for every event you reserve. Are you a member with the BNI Ontario Central North Regional BNI Franchise? Receive a discount on the meeting room rental fee. Have a full-time office with us? Yes, you will receive a discount, too! Contact Tammy L. Lorette, our Director of WOW!, to learn more, arrange a tour and get your Training Room dates booked. Copyright ©2017 OfficeInc!. All Rights Reserved.